The Royal Navy has prided itself—and not without reason—in having a proud and distinguished tradition, longer even than the British Army. To that end, it continues to have and develop state-of-the-art equipment that will allow it to do its job and sustain that tradition. The most recent step along that road has been the £127m programme initiated in 2010 by the MoD with BAE Systems to develop the Type 26 frigate Global Combat Ship (GCS), previously known as the Future Surface Combatant. These ships are to be completed from 2021 onward, replacing Type 22 (‘Broadsword’ Class) and Type23 (‘Duke’ Class) frigates, currently in RN service. Far from their humble WWII origins as cheap, sluggish 1,300 ton convoy escorts, frigates have become the backbone of ‘blue-water’ navies capable of deployment far from friendly bases. To do this, they have developed into 5,400-ton weapons platforms that can touch 30 knots and cruise over 10,000 miles. The Type 26 will use stealth technology and can be configured for several roles, such as Anti-submarine warfare (ASW), each ship costing from £250m to £350m, depending on equipment configuration. But, more practically than that, the decision about where such ships would be built lies as much with BAE as with the MoD. And, anyway, what do they have as alternatives? 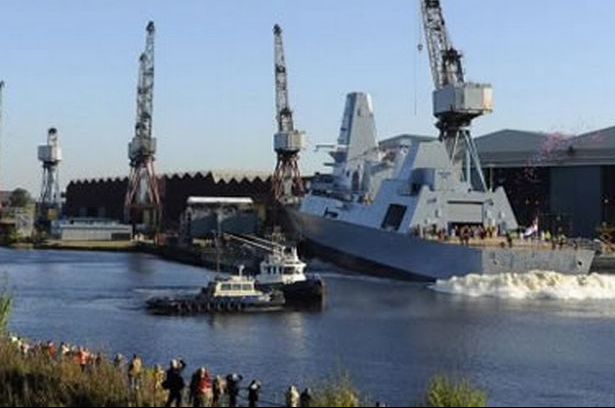 The BBC’s Scottish Business & Economy editor, Douglas Fraser, has written a sensible piece on this topic, pointing out that the only capable site outside Scotland is BAE Systems other shipyard in Portsmouth. Whatever differences Scotland and England may feel they have now or in the future, it will be in the interests of both to be close friends—closer even that Eire currently is to the UK because neither would benefit from loss of the currently close levels of co-operation. Unlike Portsmouth, BAE’s Yarrow and Fairfield yards on the Clyde and at Rosyth have been building modern warships for decades. In fact, shipbuilding—especially of warships—has grown on the Clyde, with the workforce doubling to almost 4,000 over the last decade and key companies like engine manufacturers Rolls-Royce and SELEX Galileo, one of Europe’s leading avionics companies based in Edinburgh benefitting from the growth. It is true that, in an independent Scotland, the MoD would be under no obligation to feed contracts out in a steady stream to allow optimal use of the skilled workforce. But, on the other hand, Turkey, Australia, India, Malaysia, New Zealand and Brazil have all expressed interest in the design and are potential customers. Portsmouth learning all the skills and expanding the capacity to handle all RN and/or export markets makes no economic sense—such overhead can’t be justified in this era of tight budgets. Perhaps the most ironic element of all this is that Scotland would be unlikely to build any spiffy new frigates for the Scottish Defence Force. Not only do we not need global deployment (their 10,000-mile range is overkill) but the very RN ships that Type 26s are to replace actually fill the role we require far more economically, especially if refurbished with transom flap, Intersleek anti-fouling paint and Type 2087 sonar. Better yet: the Scottish ‘share’ of the 19 Type 22/23 frigates active with the RN would be two, roughly the naval defence element we would need, especially if operated with the RN. The advantage to Scotland from that would be that both ships would be based and deployed in our waters—unlike at present where the nearest active RN frigate is actually at Gibraltar and poorly placed to intervene in any terrorist attack on, say, North Sea oil. To sensible minds (that includes those in the MoD and Admiralty), building the Type 26 in Scotland is the best/cheapest solution for England: for the price of two ships they’d pay off anyway, they get England’s Northern flank protected by a stronger force, reliable and friendly as if it were the RN itself (because most personnel would BE ex-RN). They would also get much cheaper unit costs if we were to build Type 26’s for allies as well as RN. Only the Clyde has such capacity. Meantime, Scotland gets the core of its Navy for free. The best deals are those where both parties win. That should be the independence debate theme—not singing Jim Murphy’s dolorous dirge that matches his long face. This entry was posted in Commerce and tagged Royal Navy; shipbuilding; BAE contracts. Bookmark the permalink.